A superb 22 day journey of discovery around the North and South Islands with time to stop and explore the beautiful cities and natural wonders. On arrival at Auckland Airport, you are met and transferred to your hotel. Spend the remainder of the day at leisure. In the Maori language, Auckland is known as Tamaki Makau Rau, the city of 100 lovers. It earned this name because it was a place desired by all and conquered by many. The Auckland region boasts three harbours, two mountain ranges, 48 volcanic cones and more than 50 islands. Auckland’s population is approximately 1.3 million, making it by far the largest city in New Zealand, with one third of the country’s entire population. Spend the day at leisure in Auckland. You may like to visit the Auckland Domain and Gardens – home of the War Memorial Museum, historic Parnell Village, Kelly Tarlton’s Underwater World or the Sky Tower (the Southern Hemisphere’s tallest tower) for magnificent 360 degree views of Auckland City. This morning collect your Hertz rental car in Auckland and make your way to Pauanui or Whangamata on the Coromandel Peninsula. Spend the remainder of the day at leisure. This area, about 1.5 hours drive from Auckland is renowned for its native pohutukawa trees on its West Coast and the beautiful white sandy beaches on the East Coast. The historical past of this region is evident in the mining relics, logging dams and Maori Pa sites that dot the landscape. The central ranges of native rainforest are also popular with hikers & trampers. Many activities are possible in this area, mainly of a walking or water related nature. Today make your way to Rotorua. Spend the remainder of the day at leisure. 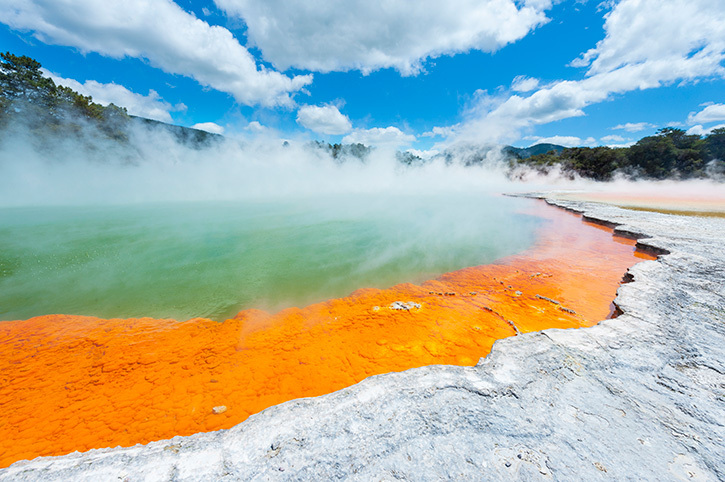 Rotorua is the centre of the intense thermal activity in New Zealand. The city itself is situated on the shores of Lake Rotorua and excellent stream and lake fishing is abundant. Geysers, pools of boiling mud, crystal springs and hot mineral water and richly coloured craters make Rotorua one of the world’s great tourist attractions. Spend the day at leisure in Rotorua. You may wish to visit to Te Puia (optional own cost) – one of Rotorua’s famous thermal areas, with the country’s largest geyser, Pohutu (playing to about 31m), the Prince of Wales’ Feathers geyser, boiling mud pools and silica terraces. Make your way to Napier – the art deco capital of New Zealand. The centre of the Hawkes Bay region of New Zealand, Napier is renowned for both its Art Deco architecture and also for its wine industry. Said to be one of the warmest regions in the country with warm summers and mild winters. There are many activities from adventure seeking, wine tasting to just browsing around the local art deco shopping areas. Make your way to and spend the remainder of the day in Wellington. Wellington, the capital city of New Zealand lies at the southern end of the North Island. On the shores of a magnificent harbour and surrounded by the rugged beauty of green hills, it is one of the most scenic cities. Some of the best views are obtained from the hilltops especially from the Mt Victoria lookout. Public buildings of interest are the Dominion Museum and National Art Gallery, parliament buildings and the Alexander Turnbull library. A must see attraction in the “capital” is New Zealand’s National Museum. Named “Te Papa” (our place) it contains a wealth of information on New Zealand’s past, present and future, many interactive exhibits, multi-media database and fascinating collections. Spend the day at leisure in Wellington. Wellington is proud of its reputation as the Arts and Cultural Capital of New Zealand. The New Zealand Symphony Orchestra, the Royal New Zealand Ballet, and the National Opera all call Wellington home. The City Gallery in Civic Square shows national and international contemporary art exhibitions of outstanding quality. Civic Square is home to the Visitor Information Centre and connects the city to the waterfront by the impressive City to Sea Bridge. There are many art galleries around the city as well as fascinating museums including the Museum of Wellington City and Sea, and the New Zealand Academy of Fine Art at Queens Wharf. This morning return your rental car to the Ferry Terminal Depot. Board the InterIslander Ferry for your journey across Cook Strait to Picton. On arrival in Picton collect your rental car and make your way to Blenheim. Spend the remainder of the day at leisure. Blenheim regularly tops the sunshine stakes and has consequently earned the title of the Sunniest Town in New Zealand. Orchards, vineyards and horticultural products benefit from the sunny climate of the Marlborough region. The country’s most extensive area of grapes is planted in the Wairau Valley and has earned international acclaim. The wine trail is now established linking the various wineries and is a popular attraction. Blenheim is also well known for crafts and the art and craft trail includes more than 30 Marlborough craftspeople open to visitors, including weavers, artists, silk painters, bone carvers, dried flower arrangers, potters and wood sculptors. Make your way to Nelson. Spend the remainder of the day at leisure. Located at the top end of the south island, this area has the reputation for having the most sunshine hours in New Zealand. It also has one of the most scenic National Parks in the country (Abel Tasman National Park) therefore activities such as tramping, swimming, sailing or just relaxing are popular in the region. A number of Award winning wineries and gourmet food industries are found in this area. From the idyllic coves and sounds to the lush private gardens – this region has it all. 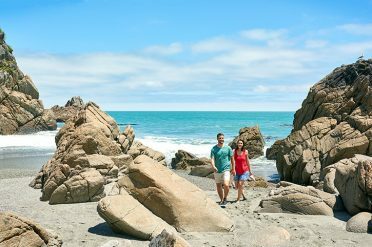 Make your way to Greymouth or Hokitika. En route you may like to stop at Punakaiki and visit the famous “Pancake Rocks”. Make your way down the West Coast to Franz Josef. Spend the remainder of the day at leisure. Nowhere in the world’s temperate zones are glaciers as accessible as South Westland’s most famous pair, Franz Josef and Fox. Both descend to levels of about 1000 feet (300 metres) above sea level. 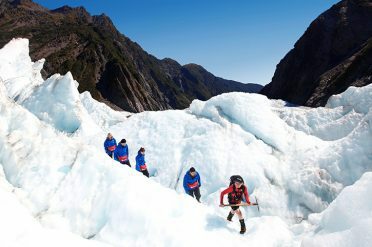 Franz Josef Glacier is a remnant of a much older, larger glacier which flowed from the alpine snowfields right to the sea. The glacier is over 12 kilometres long extending into the rainforest just 5 kilometres from the Franz Josef township, making it easy to visit. Walk to viewpoints or for a close-up view of the spectacular ice formations, take a guided glacier walk, heli-hike excursion or scenic flight. Make your way to Wanaka. Spend the remainder of the day at leisure. 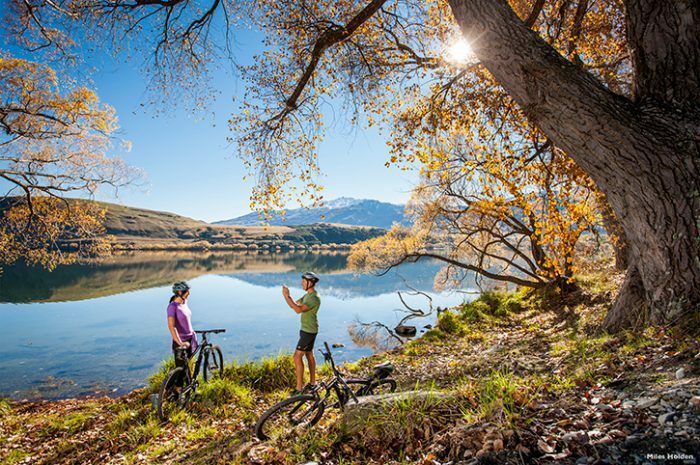 Any time of year is a great time to visit Wanaka – summer or winter. 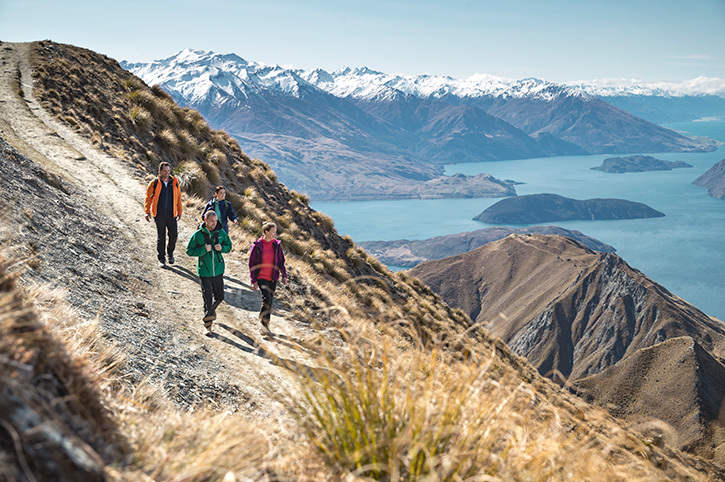 This area, situated between Mt Cook and Queenstown offers many diverse activities from passive recreation to action packed. The summer is hot and dry, while winter is cold and clear. Abseiling, boating, golfing, gliding, mountaineering, paragliding, Nordic skiing, snowboarding and wine tasting are only some of the activities available in the region. Depart Wanaka and make your way to Queenstown. Spend the remainder of the day at leisure. Queenstown nestles in Queenstown Bay, about midway along the eastern shores of the azure blue waters of Lake Wakatipu. An unusual feature of the lake is the regular “breathing”, a 3-inch rise and fall every 15 minutes. Striking mountain peaks surround Queenstown, and although still rural in character, the town has developed into a tourist resort for all seasons. Situated more than 300 metres above sea level, it is sufficiently inland to provide a sharp contrast between the hot summer and bracing winter. The autumn colours and the Lake District are justly famous and a delight to photographers and painters. Winter brings spectacular snow scenery, ice-skating, skiing, heli-skiing and snowboarding. Year round adventure activities include world famous bungee jumping, white water rafting, parapenting and much more. Full day at your leisure for optional sightseeing: thrilling jet boat rides, vintage steamer lake cruises, visit to high country sheep stations, mountain gondola rides — the list is endless and you also have time to relax and simply marvel at the beautiful scenery. Make your way to Te Anau. Spend the remainder of the day at leisure. Te Anau with its setting of mountain lakes, forest and fiords, unspoiled, rugged and beautiful is the natural gateway to Fiordland National Park and for trips to Lake Manapouri, the Eglinton Valley and Milford Sound. Spend a full day at leisure in Te Anau. We suggest you travel to Milford Sound (approximately 250 kms round trip) to enjoy a cruise on the scenic sound (at your own expense). Make your way to Dunedin – the “Edinburgh of the South”. This afternoon in Dunedin time is available to explore — you may like to visit the Otago Peninsula – home of the Royal Albatross Colony, the Yellow Penguins or historic Larnach Castle (at your own expense). Make your way to Oamaru today. Spend the remainder of the day at leisure. Make your way to Christchurch. Spend the remainder of the day at leisure. Christchurch is known as the “most English City outside England” or the “garden city”. The city was planned around the Canterbury Cathedral, whose 65 metre spire dominates almost any view of the city. Gothic in design, and like many of the city’s buildings, the cathedral is built out of rough grey local stone. From the unique Summit Road there is a magnificent view of the Canterbury Plains, bounded on the west by the Southern Alps and on the east by the Lyttleton Harbour and the Banks Peninsula. Spend a full day at leisure in Christchurch. Take a final look at Christchurch before returning your car to the airport and catching your onward flight. Our Deluxe Ultimate New Zealand Self Drive includes all the benefits of our standard option and offers superior hotel accommodation. Upgrade your self drive from Standard to Deluxe. Deluxe hotels include breakfast and offer more intimate accommodation from lodges to country houses and small hotels. Enjoy a warm welcome and personal service.